Bushtracker Forum :: View topic - SIGNS OF WATER STAINS AROUND OR BELOW THE WINDOWS? SIGNS OF WATER STAINS AROUND OR BELOW THE WINDOWS? Posted: Mon Apr 04, 2016 8:28 am Post subject: SIGNS OF WATER STAINS AROUND OR BELOW THE WINDOWS? For those buying older vans, here is the problem if you see stains around or below the windows.. This is really for the older style Camec windows, and signs of water stains or damage below the windows is a Maintenance issue, or should I say LACK of maintenance issue.. This really only relates to vans before about 2008, since then we have a double glazed Euro window with a huge O-ring seal and double dog down handles.. It is still possible to see water stains, the window can be defective, or left open in the rain, but it is very rare in comparison. 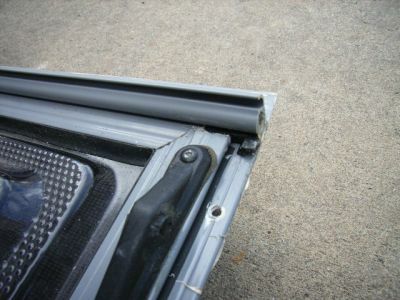 If the van is stationary and the leak shows up: There are a number of causes, but one is if the van is left parked with the front end up, the angle of the bottom sill on the window can let the water come into the van instead of draining back out of the slit drains on the outside front. The frame can fill with water and run inside instead. For both front and side windows: Then there are a variety of other things that can contribute, like the winder boxes drain hole plugging up. You can find that out by winding the window all the way open and there is a little hole in the outside face of the winder box that lets the water out into the frame, as the water seeps in down the hinge point into the winder box itself.... The grease in the winder box will pack up that drain hole in maybe 1 in 100 vans. Or it can get blocked up with dust for instance.. 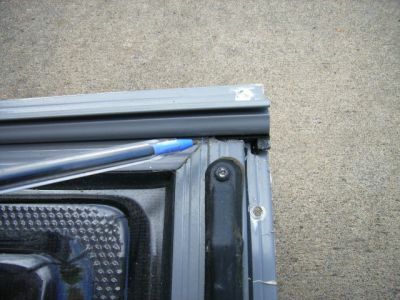 There are a couple of other potential leak points on the window, whether in the front or side windows, like around the hinge point, or if the rubber seal is creased or folded over.... 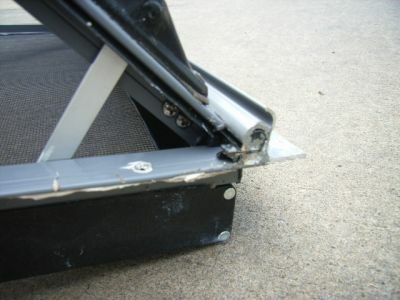 This might be why it might not show up on water testing, is that if the van nose was down and the leak ran out of the front slits in the rubber seal the way it was supposed to, and then sometimes it shows up when the van nose is up, and it leaks out into the van onto the mattress, or dripped from the winder boxes if their drain holes are plugged up. Also check that the two stage lock is actually on the tighter second stage and the rubber seal on the window is not creased or folded and the second stage of the lock has sucked it down tight. If in the case of a front window...The van leaks when traveling it is different again! Now the main culprit seems to be the aerodynamics of the tow vehicle itself in most cases. Some tow vehicles seem to create an updraft of air at the bottom edge of the window that forces the water to back up inside the frame instead of running out… We fix most of those with a “J” mould in alloy along the bottom of the window to break up that air flow… We are also working on a new stone guard window cover in development, that will break up that air pressure. If all else fails, we have invented a 50mm x 25mm angle that rivets on the outside window shade stoneguard bottom, with a piece of hatch pinchweld on the bottom of the angle so it seals against the cladding on the front when the stoneguard is closed. That has worked on the hard ones... Where the aerodynamics of the tow vehicle dammed up the water from coming out the drains at the bottom..
Also with air pressure or even on a side window: Another Culprit is the hinge cover “link block” on the outside of the window, (a small black triangular cover), can have the hinge pin leak through the rivets or the gasket underneath… A little smear of silicone is the fix in that case. Then: Wind the window open all the way, and put a small bit of Silicone up under the edge of the window at the hinge point for that 20mm gap. 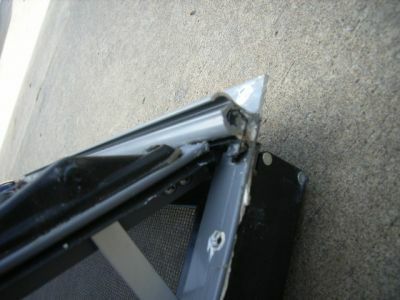 Then close the window down and let it cure for a couple of days... What happens is that the way the window is designed, where the vertical part of the frame of the opening part of the window, hits the hinge point, there is a 2mm gap for about 20 mm in from the edge of that outer window frame. They silicone that gap on the outside from new. But it can wear away from use... 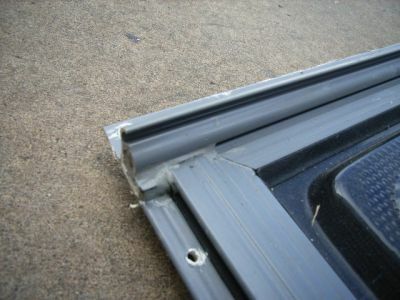 Anyway, you open the window up all the way, and put a small bead of silicone for about 20mm in from the edge up at the top of the window, as close to the hinge point as you can get. Then you close the window down and let it cure for a couple of days to let it cure.. The "lost or last or lone... Ranger"